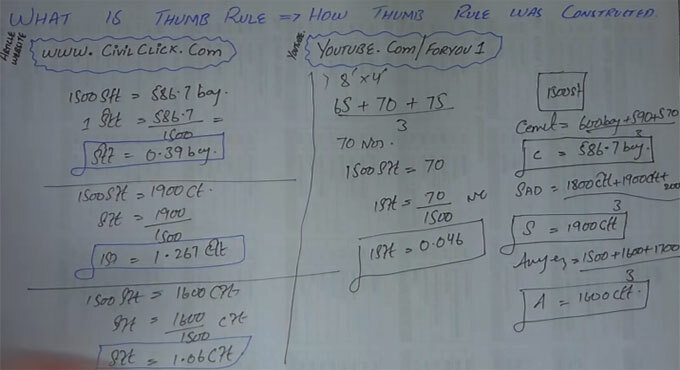 In this construction video tutorial, one will learn the fundamentals of thumb rules which are applied in making the rough estimation of the various materials employed in construction works. Suppose, the total covered areas of the construction site are taken as 1500 square feet. It comprises of foundation, plinth, lintel, beam, column and roof area. Suppose, cement is used in various locations as 600 bags, 590 bags, 570 bags etc. Suppose, sand is used in various types of construction works as 1800 cft, 1900 cft, 200 cft. Suppose, aggregate is used for various types of construction works as 1500 cft, 1600 cft, 1700 cft. This is the application of thumb rule. If the covered area is changed, the quantities of materials will also be changed. The same process can be applied for finding out the quantities of cement and aggregates in 1 square feet. For more information, watch the following construction video tutorial.